Ed King’s Mississippi: Behind the Scenes of Freedom Summer features more than forty unpublished black-and-white photographs and substantial writings by the prominent civil rights activist Rev. Ed King. The images and text provide a unique perspective on Mississippi during the summer of 1964. Taken in Jackson, Greenwood, and Philadelphia, the photographs showcase informal images of Martin Luther King Jr., Andrew Young, Mississippi civil rights workers, and college student volunteers in the movement. 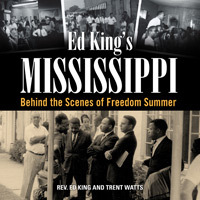 Ed King’s writings offer background and insights on the motivations and work of Freedom Summer volunteers, on the racial climate of Mississippi during the late 1950s and 1960s, and on the grassroots efforts by black Mississippians to enter the political arena and exercise their fundamental civil rights. King, a native of Vicksburg and a Methodist minister, was a founder of the Mississippi Freedom Democratic Party and a key figure in the civil rights movement in the 1960s. As one of the few white Mississippians with a leadership position in the movement, his words and photographs offer a rare behind-the-scenes chronicle of events in the state during Freedom Summer. Historian Trent Watts furnishes a substantial introduction to the volume and offers background on the Freedom Summer campaign as well as an overview of King’s civil rights activism from the late 1950s to the present day. Rev. Ed King, Jackson, Mississippi, was a major figure in the civil rights movement in Mississippi. A chaplain at Tougaloo College, he also became a key leader of the Mississippi Freedom Democratic Party (MFDP). In the 1963 Freedom Vote mock campaign and election, King ran for lieutenant governor and Aaron Henry, president of the Mississippi NAACP, ran for governor. King was an MFDP delegate to the 1964 and 1968 Democratic National Conventions and helped found the Mississippi Civil Liberties Union. Trent Watts, Rolla, Missouri, is associate professor of American studies at the Missouri University of Science and Technology. He is the author of One Homogeneous People: Narratives of White Southern Identity, 1890-1920 and White Masculinity in the Recent South.